Kevin Pietersen has not been included in England's 30-man squad for the World Twenty20 in Sri Lanka, which features one-day captain Alastair Cook. 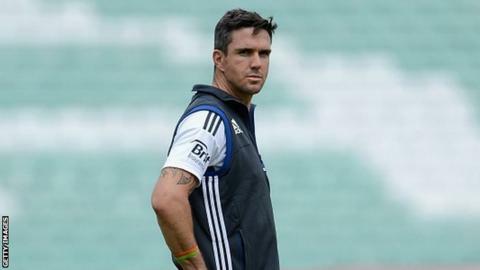 Pietersen, 32, quit limited-overs internationals in May after an impasse with the England & Wales Cricket Board, only to hint at a U-turn last week. But negotiations with the board did not reach a resolution in time for him to be named in the preliminary squad. Cook has not played a Twenty20 match for England since November 2009. But his prolific run-scoring since taking over the one-day captaincy last year pushed his case for inclusion. Yorkshire batsman Joe Root and Lancashire all-rounder Steven Croft are the only players in the squad not to have been capped by England in any form of the game. The party features Surrey off-spinner Gareth Batty and Test wicketkeeper Matt Prior as well as 10 of the squad who helped England win the tournament in the West Indies two years ago. Squads for the World Twenty20 must be cut to 15 players by 18 August, one month before the tournament starts. Players from outside the original 30 can be drafted in, but once the 15-man squad is announced only injured players can be replaced. Pietersen, who has 1,176 Twenty20 runs, was player of the tournament when England lifted the trophy in 2010. Exasperated by the demands of international cricket's schedule, he retired from the one-day and Twenty20 formats after the ECB insisted all centrally contracted players must make themselves available for both teams. However, reports at the weekend suggested he was willing to reconsider if he was permitted to play all six weeks of future Indian Premier League tournaments, rather than the three currently allowed by the ECB. That would mean potentially missing England Test matches in the early part of the English summer. Asked on Saturday if talks with the ECB about his limited overs future had begun, Pietersen replied: "I think so." England Test captain Andrew Strauss insisted he had not been involved in talks between Pietersen and the board and that the England players were focused solely on the three-Test series against South Africa, which starts on Thursday. "It's very important that it isn't a distraction to us and the best way to do that is to concentrate on this game coming up," Strauss told BBC Sport. "Whatever happens in the future is in the future. It is not for us to worry about right at the moment. "There might come a time when I need to sit down with him but at the moment we are just not focused on that." England's provisional 30-man squad for the ICC World Twenty20 in September: Stuart Broad (Nottinghamshire) (Capt), James Anderson (Lancashire), Jonathan Bairstow (Yorkshire), Gareth Batty (Surrey), Ian Bell (Warwickshire), Ravi Bopara (Essex), Scott Borthwick (Durham), Tim Bresnan (Yorkshire), Danny Briggs (Hampshire), Jos Buttler (Somerset), Alastair Cook (Essex), Steven Croft (Lancashire), Steven Davies (Surrey), Jade Dernbach (Surrey), Steven Finn (Middlesex), Alex Hales (Nottinghamshire), Craig Kieswetter (Somerset), Michael Lumb (Nottinghamshire), Stuart Meaker (Surrey), Eoin Morgan (Middlesex), Graham Onions (Durham), Samit Patel (Nottinghamshire), Matt Prior (Sussex), Joe Root (Yorkshire), Ben Stokes (Durham), Graeme Swann (Nottinghamshire), James Taylor (Nottinghamshire), James Tredwell (Kent), Chris Woakes (Warwickshire), Luke Wright (Sussex).